Located as it is amidst the rice farms all around, the inspiration for this home, very naturally came from the surrounding paddy fields. 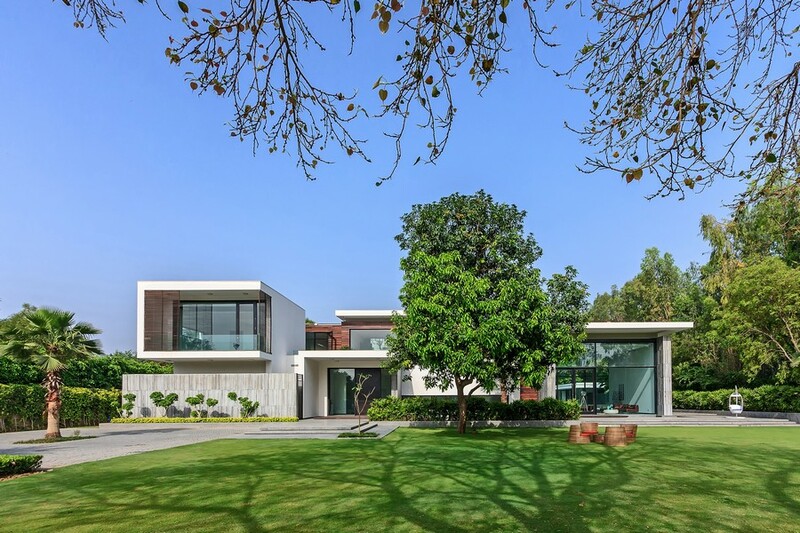 The entire house and its landscaping were designed following the principal of Less is More. And this also reflects the lifestyle and preference of the client. Also, the topography of the land became a major driving force on how the design evolved. Simple, straight and elegant spaces have been created along horizontal planes with the highlight on split levels. Taking advantage of the natural contours, three distinct levels have been created for the house. Also the rainwater harvesting and underground water storage have been successfully connected to the natural ground water here. The spectacular view of the Khadakwasla backwaters is hidden from the gates till one reaches the living area which opens up to the panoramic sight beyond. 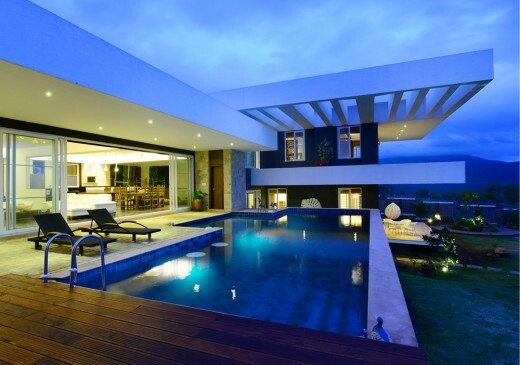 Spaces opening to the pool create an effect of continuing the backwaters inside. The open plan of the house allows plenty of spaces that are visually connected to each other. The entry level has the porch, living, dining, open kitchen, kids room and the pool deck, master bedroom is at the upper level and the mothers room is at a lower level. Project started in 2013 and got finished in 2014 and is located on the outskirts hills of Pune an IT hub of western India. Taking advantage of sloping site a technique of cutting and filling was used where ever necessary. 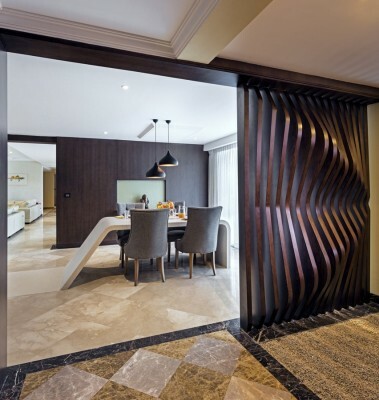 the natural contours were used to create different levels in arranging the rooms. Structure is a RCC frame structure. Central courtyard acts as a vent chute for better ventilation. The house is built on 1 Acre of land. Total built up area is 450 square meters. 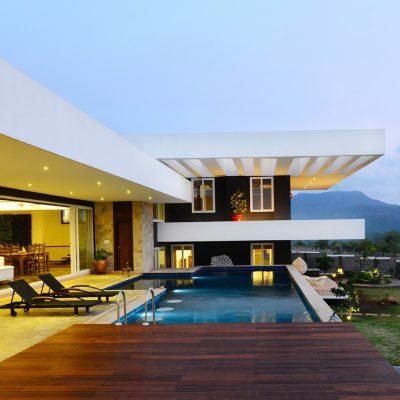 week end house, villa, bungalow, contemporary house, house, straight line architecture. Since it is a sloping land, the topography was used to an advantage by drawing inspiration from the step fields one commonly sees for paddy cultivation. Following the creed of Less is more, different levels have been created for the different areas in the house. The project started out with a few challenges that were also its biggest advantage. 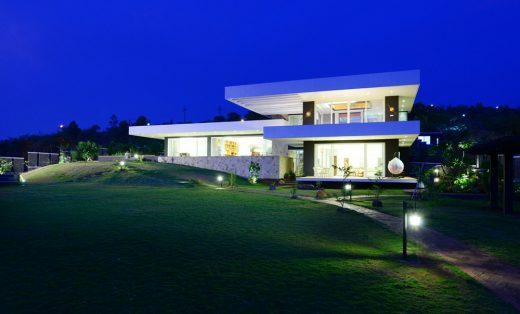 The sloping topography, while being a construction trial, was an architect’s delight as it gave us the opportunity to experiment with the design. 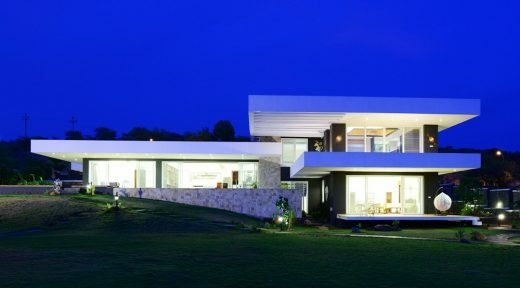 Another challenge was the brief from the client that the house should not be seen from the road. Major compulsions were to plant 450 trees on the land, and create a home for three generations of the family. Photographer Sameer Chawda, 11 K Vaks, 2014. When innovation and creativity is the main stay of a design studio, each completed work is more of an art piece than space design. Each project different from the other and hence exclusive! This is what clients have come to expect from Studio K-7. 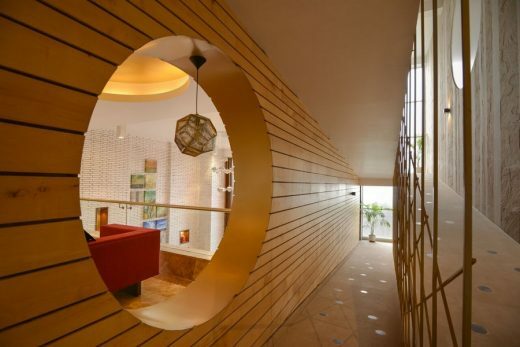 Established in 1995 as Ketan Jawdekar and Associates, under the aegis of its Principal Ketan Jawdekar, the design studio was rechristened as a private limited company in 2004 as Studio K-7 Designs Private Limited. With this came a more focused vision and the studio became an amalgamation of young and dynamic entrepreneurs who would implement innovative ideas creating exquisite projects. This has, over the years, ensured a different and exclusive output each time that has resulted in absolute client satisfaction. Aiming to providing a complete design solution, the team works on the guided principal – ‘from a pin to piano’, for almost all its projects. And this is achieved by keeping in mind, the client’s budget and individual tastes, which results in rewarding structures with world-class designs adding unusual colours to life. The design studio offers consultancy in Architecture and Interiors, and for open and public spaces. Each design is visualized and achieved by following a simple seven-point agenda: . Elegance through simplicity in design . Optimization of experience . Trouble shooting with inspiring architecture . Reflect overall theme . Harmonising with the environment . Effortless implementation . Cost effectiveness This has lead the Studio to winning many national and international accolades and awards. 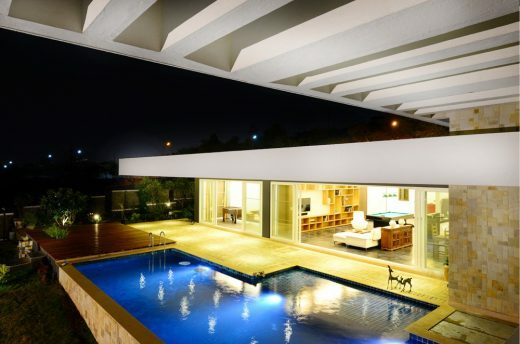 Winner – 11 K Vaks Week End House by Ketan Jawdekar is Winner in Architecture, Building and Structure Design Category, 2014-15.